Kiplinger's auto expert Jessica Anderson took your questions about our annual best new car values rankings. what's your thought on the 2012 chevy sonic hatchback? Hi there C.E. The Chevy Sonic is a pretty rad little car. It's light years better than the Aveo it replaced--quality, materials, drivetrain...you name it. Plus, it's got 10 airbags. That's one of those examples I was talking about earlier--because Chevy started with new architecture, they built in features that weren't even conceived with the previous generation. Alright, ready for our next question Jessica? Where are you getting the information to calculate the 3yr resale values? Hi Matt. The three and five year resale values are calculated by ALG and supplied by their parent company, TrueCar. I got a call from a gentleman yesterday questioning our fuel economy numbers. To be clear, we use EPA fuel economy numbers to be consistent across the board. In some cases these are higher than you'll likely get on the road and in some cases (like this gentleman's diesel VW Jetta), you'll likely get better results. Keep in mind--"your mileage will vary." That's the industry word on fuel economy and we're sticking to it. Thanks, Jessica. That's good to know. Seems fair enough -- no single person's driving habits are going to be the same. That's right. I'm a bit of a lead foot...so I never get the average! Alright, we actually have another question about our rankings from "Confused"
Every year, I'm totally confused by your rankings. You often miss cars that other experts like US News, Consumer Reports, etc. include in their rankings, and it seems like the criteria change every year. Can you please explain a bit how you come up with these picks? Particularly for best new cars? Hey Confused...I'm surprised that you think our criteria is confusing because it hasn't changed in my nearly 10 years at Kiplinger. We add new criteria in the area of safety as old criteria become federally mandated or are otherwise widely standard, but that's the only thing that really changes. Kiplinger's Best in Class winners top the rankings in each of our 12 categories. The rankings are based on performance, value and safety, as well as driving impressions from our own road tests. The Best in Class winners are our top picks among models that have a track record of at least one year or redesigned vehicles with powertrains substantially the same as the previous generation. As for US News and Consumer Reports, I have no idea what their system entails, but I can say that we often have the same picks. For example, last year, CR picked Toyota Camry Hybrid as their best family sedan and we awarded it Best New Car in its price category. This year, it becomes Best in Class. Thanks, Jessica. It's helpful to know the difference between Best in Class and Best New Cars. While we're discussing 2013's best new cars, can you talk a little bit about all of the midsize car redesigns this year? Are there any particular models that stand out from the rest? You bet. The midsize segment has just seen a ton of turnover in the last few years with a new Hyundai Sonata, Kia Optima & Toyota Camry. This year, we got a new Chevy Malibu, Ford Fusion, Nissan Altima and Honda Accord, too. Next year brings the redesigned Mazda6 and then we start all over again. Since we break cars into price categories, we had the opportunity to award 3 of the 4 new midsizes this year. First up is Ford Fusion--Best New Car in the $20,000-$25,000 category. 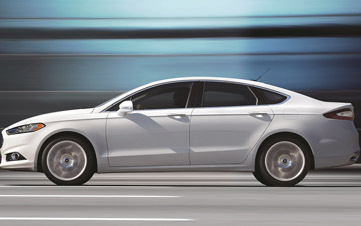 I’d say Fusion is the most daring redesign in the midsize segment since the Hyundai Sonata. It gets a really aggressive mug and is super sleek inside. There’s plenty of passenger space and it handles great. Two optional EcoBoost engines give you the choice of more power or better fuel efficiency. It's also rated a Top Safety Pick+ by the Insurance Institute for Highway Safety. Next up is the Nissan Altima--Best New Car in the $25,000-$30,000 category. 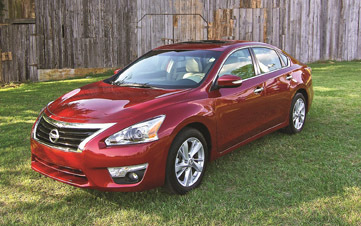 The new Altima looks like an Infiniti—great lines! Smart features include an "easy fill" tire alert, hands-free text messaging and NASA-inspired "zero gravity" front seats. The 3.5-liter V6 puts out 270 horses, but fuel economy is still respectable.